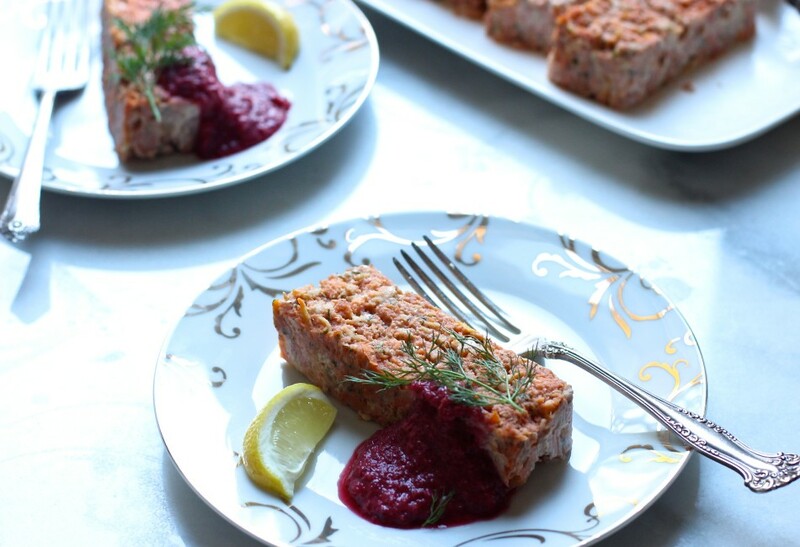 Passover is almost here (begins sundown this year on April 22nd) and, per usual, I’m itching to test out new recipes for the holiday, which got me thinking about the Passover staple food I used to love: gefilte fish. Something healthier, something tastier and something lighter was my thought process. 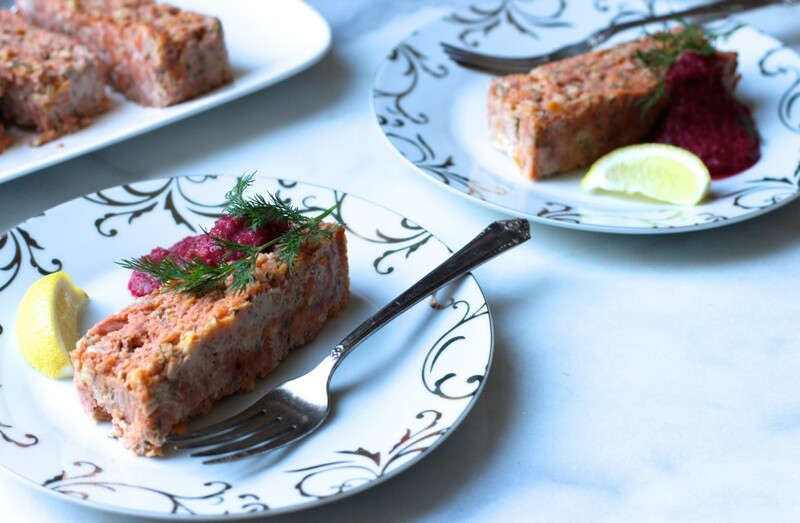 This springtime salmon terrine – aka my take on gefilte fish – came to mind and it’s nothing like the jarred stuff. For those who are not familiar: gefilte fish is ground fish (usually pike and whitefish) shaped like cutlets, immersed in a somewhat clear thick sauce and in every “kosher for Passover” supermarket section. As a kid, I would beg my mother to buy it every year (I was the only fan of it in our household). I know, I know, of all things. But it’s true, I found the sweetened fish delicious. It’s been decades since I’ve eaten it and the thought of eating it now kind of irks me. Is there really any fish in there? Ew. I think I’ve become a gefilte snob and I’m okay with it. Please don’t judge me. Thanks. 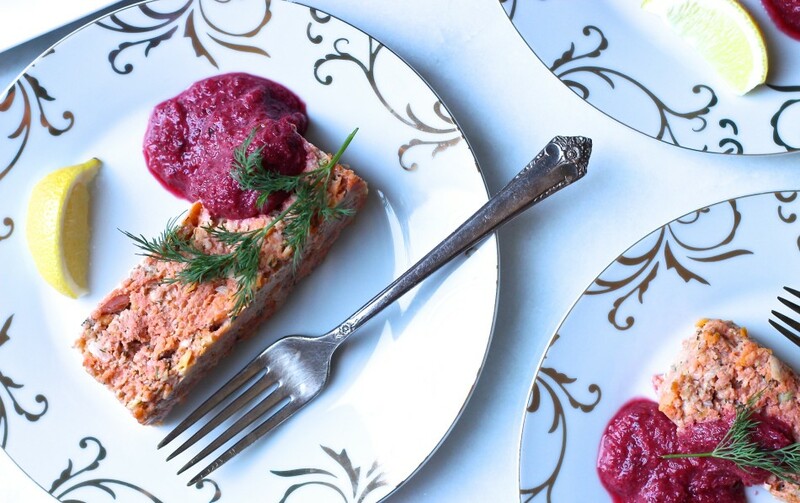 This salmon terrine is my modern take on gefilte fish for Passover, and much better (and healthier!) than the kind I remember. 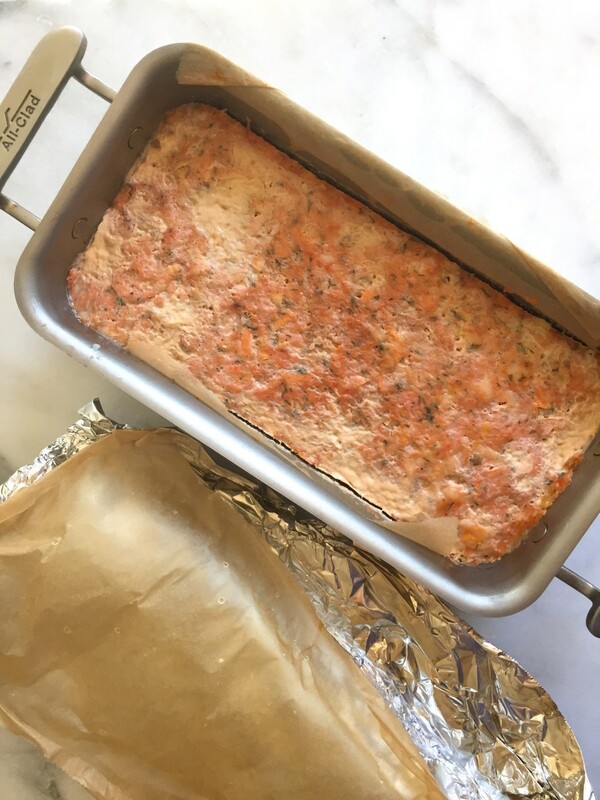 It not only tastes like a very flavored, lighter poached salmon (funny enough, that my kid’s call “salmon meatloaf”) without being tough or rubbery like poached fish can be sometimes (also less sweet than gefilte fish). 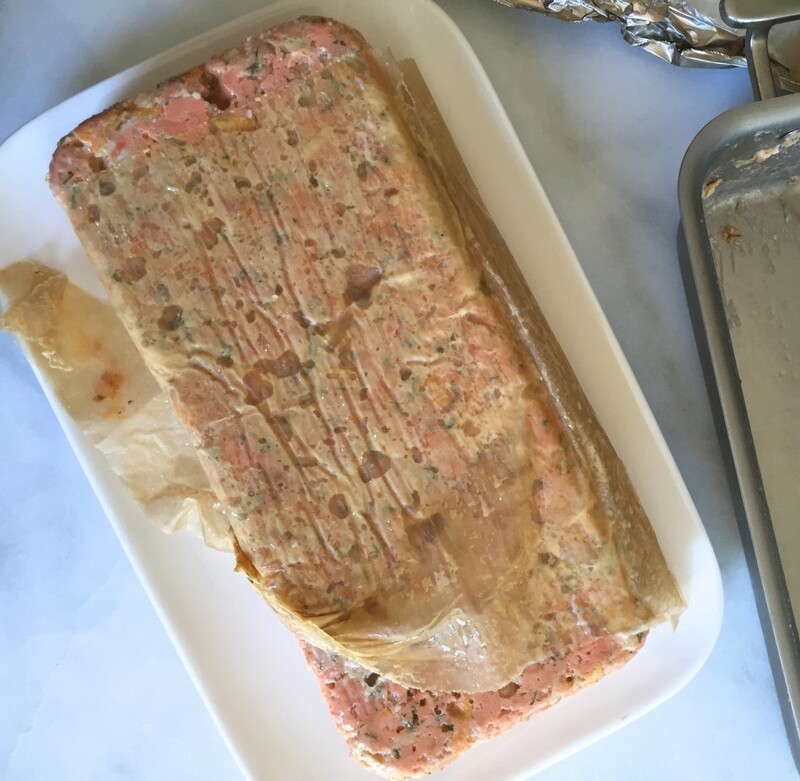 What makes the terrine so tender and foolproof is cooking it in a water bath (a process called bain-marie in French, meaning slow cooking) and tastes even better when made ahead. It also makes a lovely light lunch with a salad (think: butter lettuce with citrus and avocado drizzled with this honey ginger vinaigrette). Duck eggs are new for me. I’m exploring duck eggs since hearing that many who cannot tolerate chicken eggs do well with duck eggs. My oldest has an intolerance, not an allergy, to eggs. Please note: an allergy to chicken eggs may be to albumen or proteins from all poultry; if you have an allergy to eggs please talk to your doctor before consuming duck eggs. 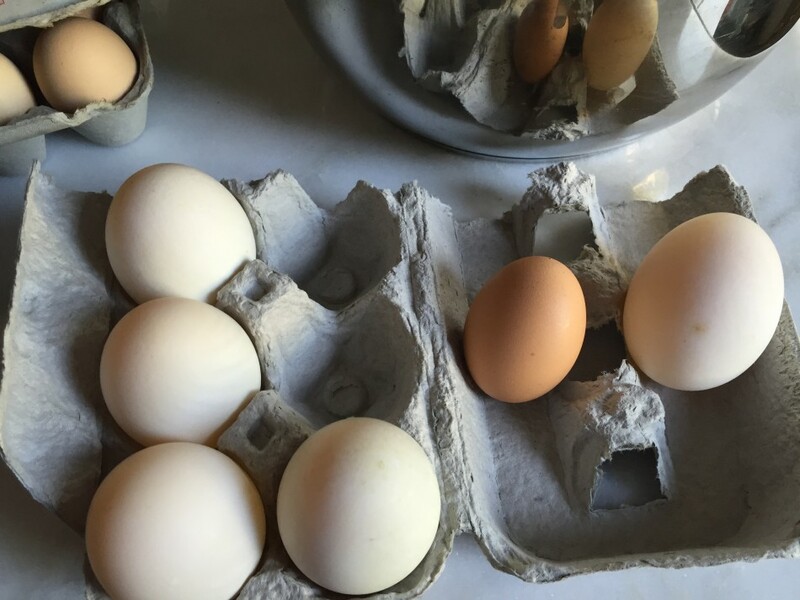 By weight: duck eggs are about 72 grams, large sized chicken eggs are about 50 grams and much richer (yolk), widely used by pastry chefs for creamier, richer baked goods. They are usually available at farmers’ markets and do cost more. 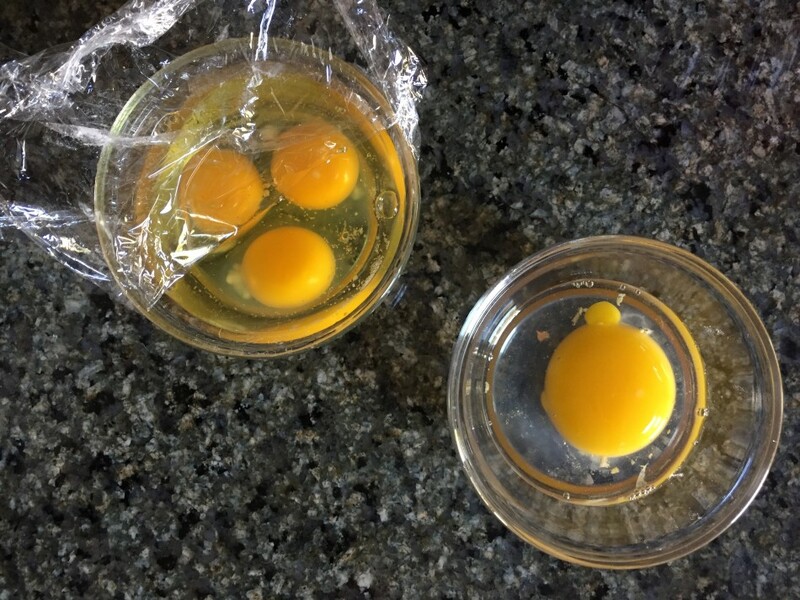 Also, they have a thicker shell that needs a firmer bang on the counter in order to crack (tip: always crack eggs in a bowl in case there is a bad egg or shell that may get into the food). Here’s a comparison. The yolk is nearly double the size and the whites are clearer than chicken whites. The thin white, milky layer over the cooked terrine is inevitable. There is no cooking technique to prevent this when using whole fresh fish, it’s due to the release of albumen, this also happens with eggs (read more on why here). Simply rest that side on the plate or gently scrape off. Make a new holiday tradition with this modern take on the Passover food gefilte fish. Foolproof and easy to make ahead for your Seder meal or as a light lunch with a salad. Much better (and healthier) than the jarred stuff! You will need a large roasting pan to contain the loaf pan for cooking in a water bath. Note on removing salmon skin: your fishmonger can pull off the skin for you or do yourself by wedging the tip of your knife between the skin and flesh to separate, then pull on the skin to completely remove. 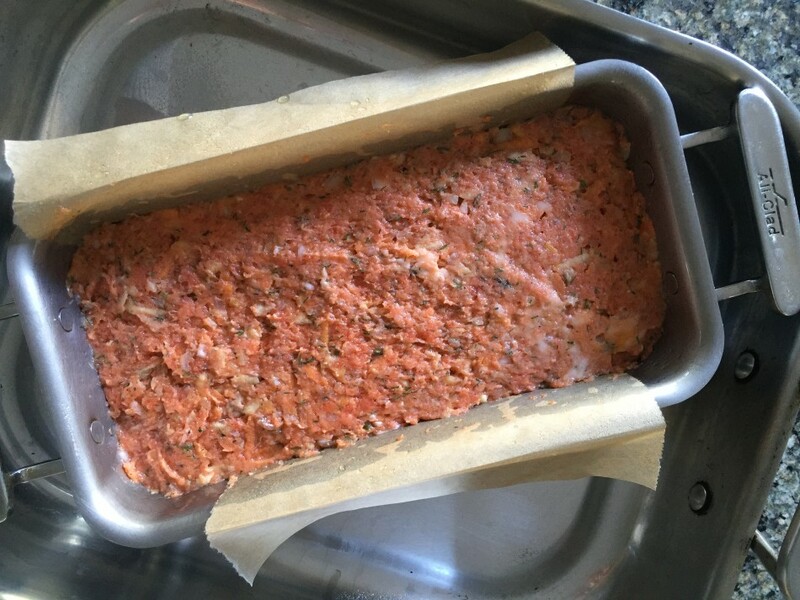 Grease the bottom of a standard- sized loaf pan then line with a piece of parchment paper with an overhang over the length of the pan (to help lift the terrine out later) and grease the paper and remaining areas of the loaf pan, set aside. In a food processor fitted with an S-blade, pulse salmon into finer pieces (or chop into large chunks by hand before adding in) then add onion, grated carrot and parsnip, dill, oil, sugar and lemon juice. Pulse until it appears a chunky ground consistency but not smooth. Add in ¾ cup water and potato starch and pulse a few times until it appears somewhat combined. In a small bowl, whisk egg, then add, along with salt and black pepper and pulse again a few more times until blended but not smooth. The idea is to keep some of the textural elements from the vegetables while fully blending the starch and seasonings and egg. Transfer mixture to the loaf pan making sure to press into the pan and its’ corners to prevent open air holes. Cover tightly with parchment-lined foil (first parchment paper then aluminum foil) then transfer to a large roasting pan. Pour enough boiling water (hot tap water is not hot enough to properly cook) into the large roasting pan to come up ¾ of the way up the sides of the loaf pan (a large 5-quart saucepan full should do). Bake for 45 minutes, until firm in the middle and slightly pulled from the edges. Gently remove the loaf pan from the water and let cool for 20 minutes. Meanwhile, for the beet horseradish: Rinse and wipe clean the food processor. Combine ingredients and blend until smooth. Chill in refrigerator until ready to use. When cooled, run a butter knife or an offset spatula around the edge of the loaf pan (careful not to rip the parchment paper) to loosen the terrine. Place a rectangular plate (or cutting board) over the loaf pan then flip. Tap the top and sides to help release it from the pan. If it’s not releasing, turn it back over and run the knife along the edges once more then try again. Once released onto the serving plate, gently lift off parchment paper. Cover with plastic wrap and chill for at least 1-2 hours, or make ahead up to 3 days before slicing and serving with beet horseradish. 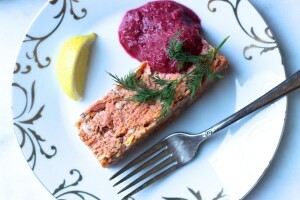 Salmon terrine will freeze well separately from the beet horseradish for up to 3 months. Note: If available, use store bought (make sure it’s gluten free and dairy free, some use vinegar that is gluten and natural flavors which can be dairy. A ‘kosher parve’ symbol on the label states it does NOT contain dairy). I didn’t have beet horseradish at my market so I made my own. Alternatively, fresh tarragon or parsley instead of dill also pair well with salmon. If wild Sockeye salmon is unavailable try another wild salmon (farmed is usually GMO fish whereas wild are in the open ocean most of their lives with minimal toxins) or wild Alaskan cod (a mild fish that pairs well with salmon should you decide to do half salmon, half Alaskan cod). After years of putting up with awful Gefilte fish it's time to put our foot down! My sister's hosting this year and perhaps this will be on the table somehow, if we can get away with not having the usual rubber on the table. But I know, we'll keep the canned stuff under Grandma's pillow as she usually naps mid meal. Sorry for going on but just got the email and thought of telling you all this! When all you see is emails of flight coupons and shoe store deals I was thrown off by this hippie-ish take on Jewish cooking. Duck eggs? Love it! Hope you get to try it...enjoy! What a great idea for Passover. Its time to make a change from the routine and boring gefilte fish to a more "elegant" salmon version. And I love the idea of making it now and freezing it for later. Can't wait to make it. Cheers to new (non-boring) food traditions! I used to love it too until I realized it's too fatty for my own good. This looks wonderful with the bright colors and appreciate the healthier take on it too. P.S. Thank you for link on why the white foamy is always on my fish. I thought it was me! You're welcome. Healthier for sure and tasty...hope you give it a try! Beautiful alternative to gefilte fish and so colorful! Any dessert recipes for Passover this year? I'm always searching for desserts other than the usual flourless chocolate cake. I'm always looking for new recipes too. I tested and retested a couple (one no bake, the other a bake) and will be posting soon! Does this freeze well? Thanks for sharing a holiday fish recipe, gefilte is usually the default and mostly made with wheat. This looks delicious. Lovely photos and recipe, how often do you serve this? Have you made this one before? Thanks, I've made this last summer and just recently. Other than Passover, I make it for dinner parties and casual lunches on hot days for it's convenient make ahead and how well it keeps in the fridge. I love this! Of course it's great for Passover but I can see serving this at the beginning of any dinner party. Beautiful! Thanks, I love how simple it is but looks fancy shmancy enough to impress when entertaining! I used chicken eggs for the recipe and wanted to tell you how pretty it turned out. I managed to pick off some for taste and feel confident everyone will enjoy this as a new gefilte fish. It was easy and tastes great. Thank you for posting the recipe in time for Passover! You are so welcome! Thank YOU Monica and Happy Passover!